Thinking of adding a boost of color to your home? Why not orange? Associated with enthusiasm and happiness, it can lend brightness and warmth to any room. 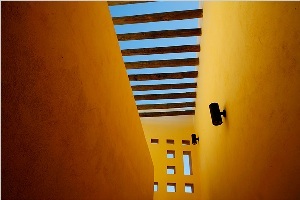 Yellow is one of the most talked about colors of all. It can be associated with vitality and sunshine, or seen as a blaring nusciance. Depending on the way it is used in a designers line up, you either love it or hate it! I love it in the Mexican adobe house shown above. 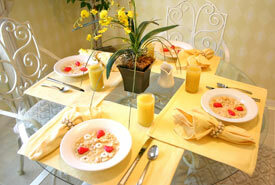 Typically used in kitchens, yellow brings in the concept of a ” sunny breakfast nook”. Shown here in much lighter tones it is rather soothing. White is a natural partner for yellow. It blends nicely when used as an accent on trim, garden furniture and accessories like these white dishes. 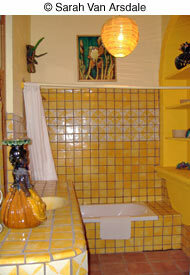 This is a little overwhelming for a bathroom… a bit too much yellow for me! Painting the yellow wall on the right white would help and adding a colorful shower curtain may take it over the top as a “so ugly it’s beautiful” room. 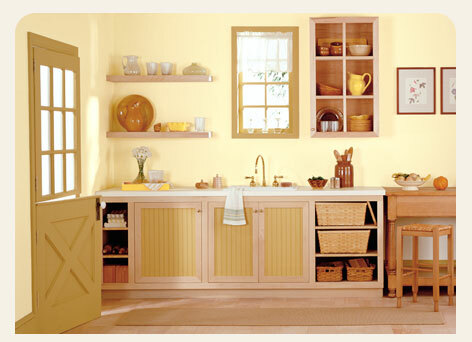 The soft yellow walls in this French country kitchen bring the light in from outside. Additional subtle accents of deep golden yellow ceramic dishes and the white counter top are great compliments. Yellow is happy, vibrant and joyful… it breathes life into all it surrounds! Red has a history of being bold and making a statement in the world of decorating. 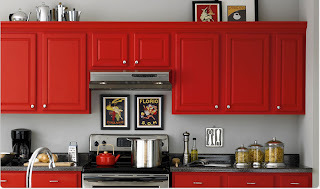 Red can be incorporated into a design scheme in more ways than one. As designers, we are not limited to paint on the wall. 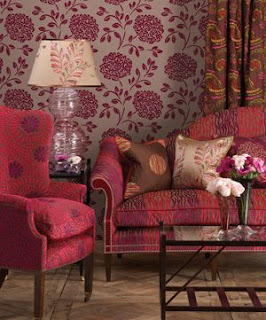 Red can be brought in through the use of different fabrics in various textures as in the photo shown above. Interior designer Tricia Guild , who takes her inspiration from places like India and Italy, is known for using strong colors in her work. Red can be used in its pure form combined with the minimalism of white. Red used in this way takes on a clean, modern appeal. I could live with one or two red chairs in a neutral setting. 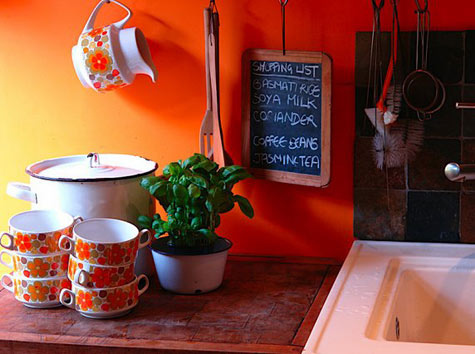 A good coat of paint can renew old cabinets or make a bold statement in a kitchen. This tomato red is known to enhance apetite and encourage conversation, this color is a perfect match! 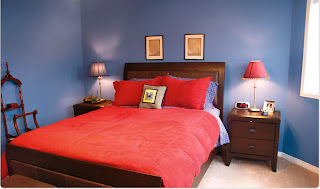 In a blue room, a red bedcover and lampshade really make it glow. This complimentary combination is a nice alternative for a bedroom. 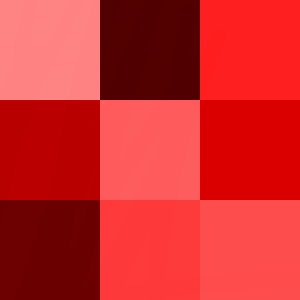 Color fact: Red is a primary color, you can’t mix it from any other color on the color wheel. This photo shows some nice red hues. Using inspirational materials can help a project along from the start. There are at least three different reds to choose from in the photo above. 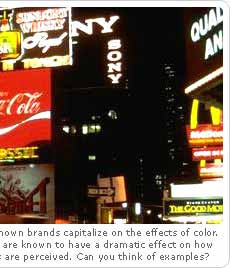 Red is a strong color when used in advertising. Coca~Cola made red famous with thier logo. look how it stands out in the advertisment on the left. Imagine the effect it has on us when used in a color story. Red is many things to many people. I love red for the energetic punch it adds to every design situation. * When it comes to color it is best to follow your instincts. I was amazed at the use of color in Michael and Nava Abel’s house featured in yesterdays “House Tour”. They must be a lively pair living with all those bright reds, oranges and yellows! By incorporating the cool colors as accents, I believe they used every color on the color wheel. * Color and light go hand in hand. Where there is light there is color. Colors change according to the kind of light and the amount of light they are exposed to. Always bring your colors to the space that they will live in. Warm colors: red, orange and yellow sit next to one another on the color wheel. They add intensity when used in a palette. Cool colors: green, blue and violet sit next to one another on the color wheel. They create an overall calmness when used in a palette. * Complimentary colors are those that are opposite on the color wheel. These colors usually work well togehter and create a visually exciting palette. The orange and green in this example do just that. 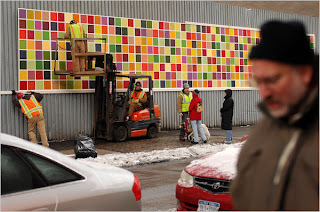 *Colors have energy and each person gravitates to their own favorite colors. The work shown here is by the Malaysian artist Tattfoo Tan. 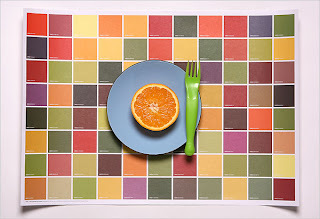 His work is made by matchng colors to different food groups, he refers to this process as the “Nature matching system”.